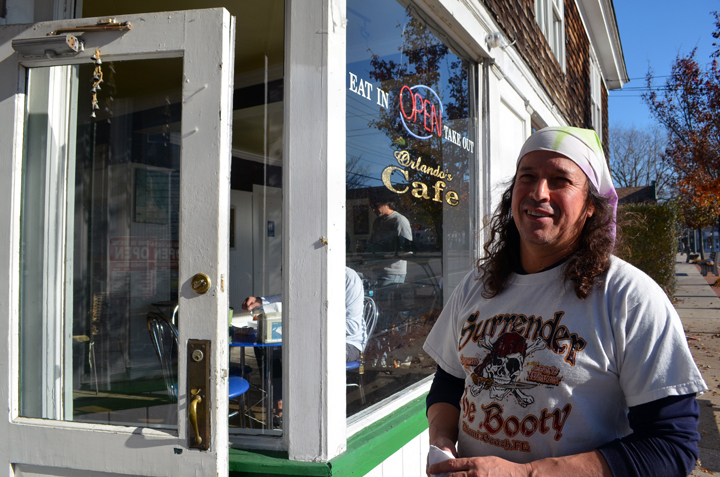 Orlando Garbanzo is the Chef and co-owner of Orlando's Café which is on Montauk Highway in Hampton Bays. Montauk Highway is the road most travelled through Long island's Hampton scene which spans from Westhampton to Montauk Point. 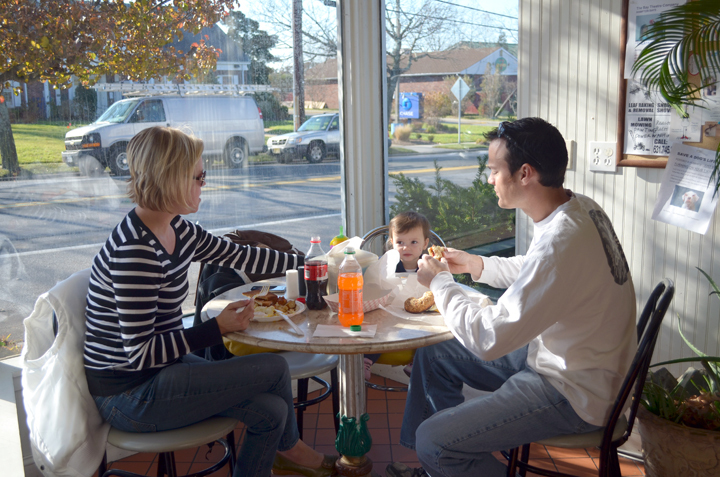 Garbanzo's loyal customers are locals, weekend warriors and vacationers who come everyday for a hot meal or simply to sit and read the newspaper with a cup of coffee. Darlene Downie is co-owner and works the front of the Café taking food orders and greeting people. I saw her give a food order to Garbanzo and when he looked at the ticket he instantly knew who the order was for. He stated, "I know all my regular customers just by looking at the ticket. I can tell you who they are." Making customers feel at home is part of Garbanzo's business and goes back to his early childhood and hometown of Turrialba, Costa Rica where he was raised in his mother's restaurant. At the age of 3 his influence to the restaurant world had begun. His father was a shoemaker and his mother a homemaker. To make ends meet his mother opened up a small restaurant in his father's shoe store where she made homemade empanadas and small bites. The restaurant did so well that his father closed the shoe store to help grow the restaurant business. When Garbanzo turned 9 he began to help out with washing glasses, filling sodas, and then eventually became a waiter. His mother cooked a variety of specialties such as beef tongue in tomato sauce, steak schnitzle, cabbage and radish salad, rice and beans with steak and plantains and two of Garbanzo's childhood favorites; a bean sandwich with potato chips and butter and a grilled cheese sandwich pressed by a waffle iron, which created these cool waffle patterns on the bread according to Garbanzo. I secretly hope Garbanzo recreates the grilled cheese sandwich using the waffle iron as I thought this was a brilliant idea out of a need. At a young age his hospitality and generosity was most influenced by observing the interaction of the diverse people who came into his mother's restaurant. Folks would come into the town by horse, bus or train to do their daily shopping and then stop by the restaurant to eat or simply read the newspaper with a cup of coffee. This is very reminiscent of Orlando's Café today as patrons take the road most travelled; the Montauk Highway to Orlando's Café in Hampton Bays. Garbanzo realized everyone was the same no matter what their occupation or beliefs; the lawyer, priest, policeman or begger was one in the same. After moving to the United States 20 years ago, Garbanzo honed his skills working locally at Crazy Dog, Station Bistro, 75 Main, John Ducks and finally New Paradise Café. Garbanzo says his style of cooking, while rooted in Costa Rica, was very much influenced by Mexican, Thai, French and Chinese cuisines. He learned how to properly make a variety of vinaigrettes and sauces, cooking with various types of meat, fish and vegetables, became enamoured with pastry and eventually learned how to manage a kitchen. The culmination of these experiences led him to open Orlando's Café at the end of 2004. Garbanzo knew there was a need to create a Café that was affordable with super friendly service and dishes which are fresh and vibrant in flavors that everyone can enjoy. Orlando's Café is refreshingly down-to-earth with a very relaxed vibe with large windows which offer sunlight all year. The diverse menu spans from breakfast sandwiches and huevos rancheros, to Costa Rican specialities like Casado of rice, black beans, salad and tortilla with meat or eggs to a few interesting Asian-derived dishes such as the thai grilled chicken salad or the cantonese fried rice. 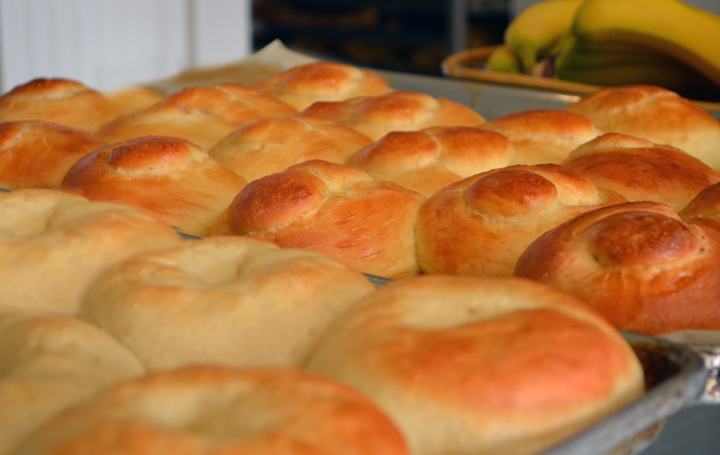 All of the baked items are made fresh everyday by Garbanzo who states, "My favorite part of the day is at 4am when I am preparing the baked goods. I love the feel of the dough, the smell of sugar and butter mixing together and cookies baking in the oven." 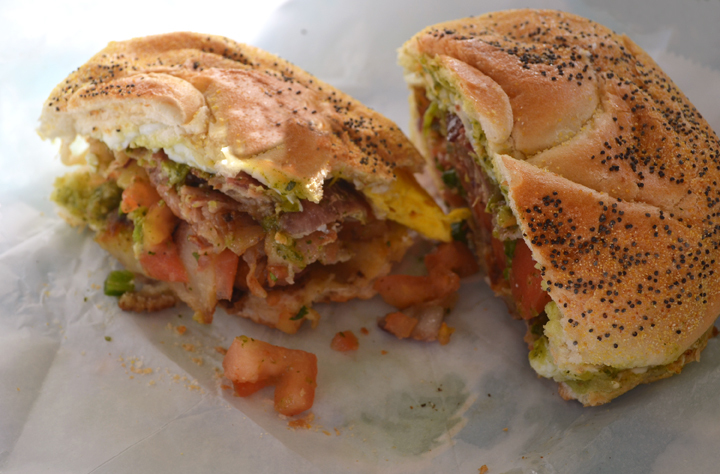 One of my favorites is the Beso Sandwich, which means kiss in spanish. I find this name to be appropriate in that it is the perfect kiss of flavors; it is bright and scrumptious on a home-made kaiser roll with bacon, egg, pico and potatoes livened up with a flavorful green sauce. You can get all of the breakfast sandwiches with egg whites for those of you watching your diets. The top selling item is the huevos rancheros. It is evident how tasty this is considering my husband could not even wait 2 minutes for me to take a photo of this dish. According to my husband it is one of the best huevos rancheros he has ever had, stating, "the balance of flavors and ingredients is perfect." 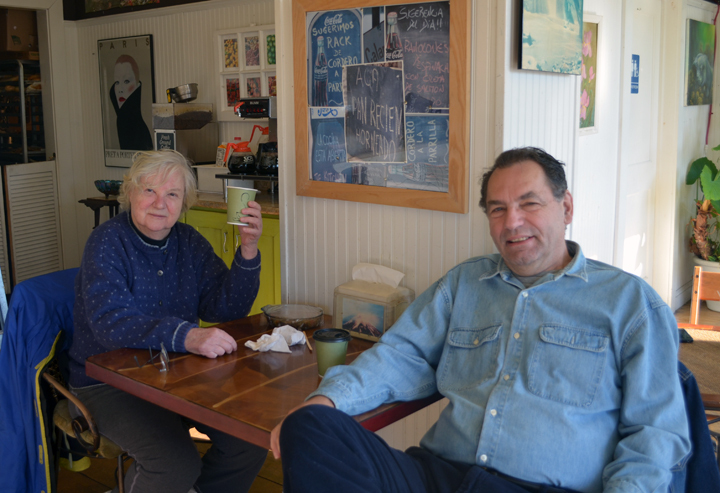 Eva and Ralph have been loyal patrons since 2004 and since then Eva has been ordering the huevos rancheros every Saturday morning and brings her own dish to take home the leftovers. I grew up on Zeppolis and considering I am Italian, I have to say these are by far the best I have ever had. My mother recently shared with me a story about my grandfather who she once caught on the side of the road in his car eating a bag full of donuts from his favorite local bakery before heading home. If he was alive today and tried these zeppolis I am afraid he would buy the entire rack and there would be a purchasing war. These golden gems are a cross between a choux pastry for profiteroles, a german pancake and an italian zeppole. They are light and delectable and worth the trip all year round and are only offered on Saturday and Sunday, so be sure to get there early as they sell out fast! Garbanzo stated, "Eva (who is shown above) also picks out her favorite Zeppole by its particular shape, which reminds her of a character or animal. " I however will take any shape and size, that is available. Homemade Challah bread in the background is used to make the deep fried french toast. 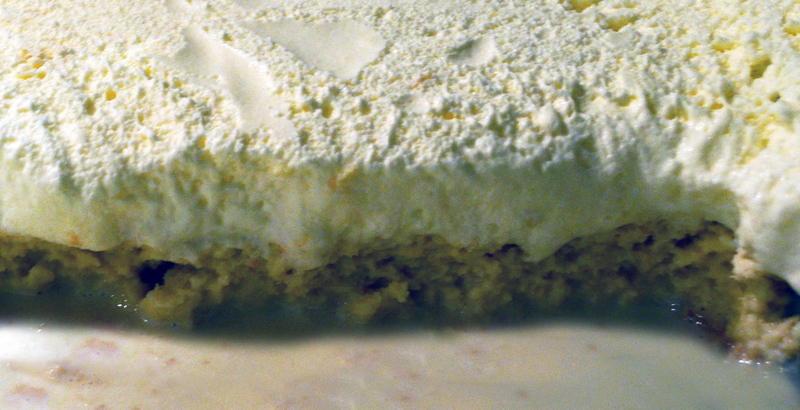 Tres Leches (three milks cake) is a recipe Garbanzo got from his sister in Costa Rica who used to own a pastry shop there. 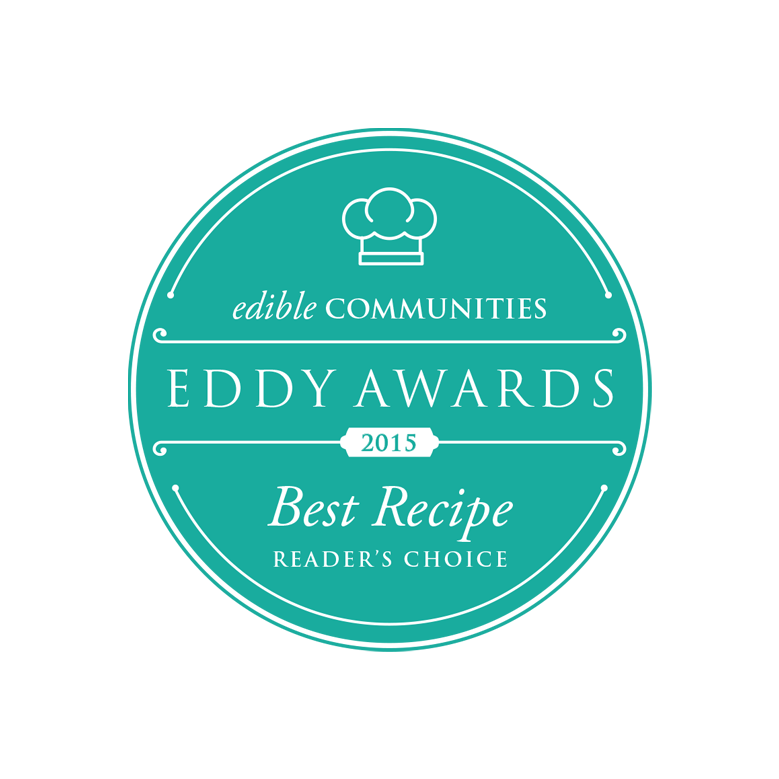 Orlando Garbanzo is passionate about his food and the community. Both him and Darlene Downie love their customers and I have to say it shows in their hospitality and the food Garbanzo creates everyday from his heart. First time this family has been to Orlando's and stated they cannot wait to come back try some of the lunch items. If I had one wish for Garbanzo it would be for his mother to take a trip to see his Café as I know she would be so proud to see it first hand. Garbanzo states, "My mother is afraid to fly so my nieces and nephews show her my creations via online." 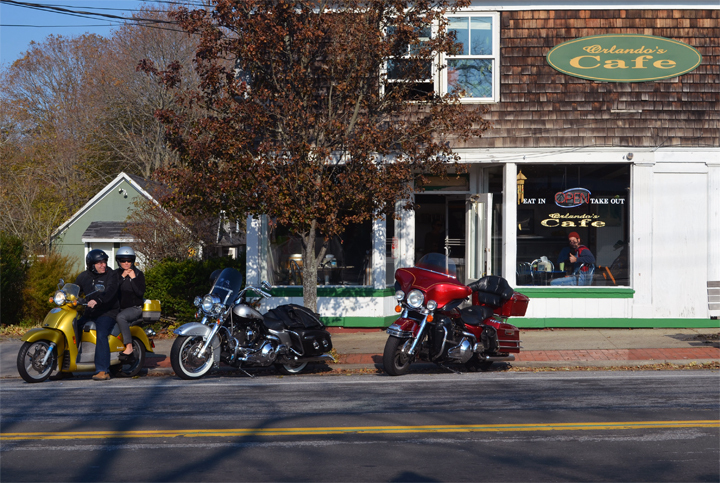 Orlando's Café sits in the heart of Hampton Bays off the main artery of Montauk Highway. 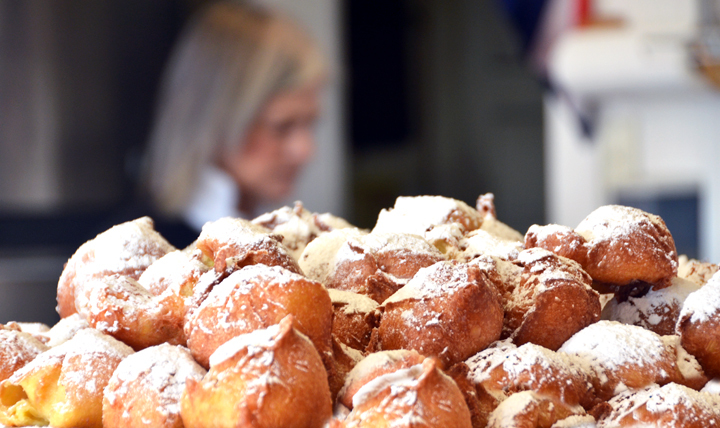 Next time you are passing through stop off and get yourself a Kiss and a Zeppole to go. Orlando's Café is open Tuesday - Sunday from 9am - 4pm and open late on Friday until 8pm. Closed on Mondays. Take-out or dine-in.